The NORMANS (Norwegian Modular Arctic Network Soldier) programme’s Kompanisett trials took place in October last year, putting the 4th company of the Telemark battalion (TmBn), a professional, mechanised unit, through its paces at the Rena training ground in the south of the country. The week long trial saw the unit going through very extensive and preplanned trials, preceded by a training period which was used to develop some initial Tactics, Techniques and Procedures. The integrated equipment set used was industrialised and developed by Thales and Teleplan, who also used equipment from other suppliers both acquired specifically for the trials and in service baseline equipment. Integration with the vehicle Battle Management System was handled by Kongsberg Defence and Aerospace (KDA). Every man in the company trials were equipped with core baseline equipment, currently issued to Norwegian soldiers, which included night vision equipment, weapons and body armour. The company was then divided into two platoons, each of four sections with one platoon, given the additional NORMANS equipment through which to measure comparative performance. Two scenarios used in the trials; a 36 hour Operations Other Than War (OOTW) mission which was largely dismounted and a more conventional warfighting scenario. The FFI noted no substantive difference in terms of the enhanced performance provided by NORMANS between the two scenarios although, it was more marked, as might be expected, in the dismounted mission. The trials gave each soldier access to an atypically high level of Situational Awareness. Lausund cited the difference in the NORMANS system to other soldier modernisation programmes around the world whose approach has limited the role of riflemen to that of a sensor ‘emitter’ only. In contrast, NORMANS Light, industrialised and further developed by Thales, has given each individual soldier in the squad, a visual situational awareness tool and considerably more. Individual soldiers were each given a NORMANS Light system. Commanders were given the Advanced System which has more functionality, based around a PDA and also had access to higher level BMS via a VHF combat net radio. The central spine of the Rena training ground is very densely forested, with Cook comparing it to jungle. “It is an area in which GPS can potentially have problems and it also soaks up radio signals. One of the unforeseen benefits of NORMANS was that digital communication can punch through that a lot better. The NORMANS Light system’s GPS system has proved particularly accurate.” Civil GPS systems were used by NORMANS coupled with a military PLGR at section level and above for commanders. Norway is currently adding DAGR to its inventory. 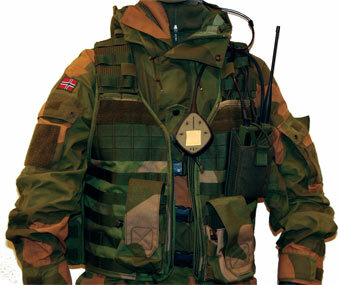 The Telemark battalion company were also issued with PLRF15C which can be integrated into the NORMANS Light and Advanced systems to generate a grid reference on the system. This was something the troops in the trial valued extremely highly. THE ‘NATO SOLDIER MODERNISATION MEASUREMENT FOR ANALYSYS: a framework for modelling and trials’ document was used to develop the Kompanisett trials. The NATO document was originally developed from the FIST Technology Demonstrator and was subsequently updated and issued in 2005. It defined specific missions and vignettes and the, MPO, MOE and MOOE associated with the assessment of C2. The NORMANS team believes that taking the document and modifying it to apply it to other NATO capability domains could give it a wider audience and appeal.